Paddle boarding the channels of Mangrove Cay. 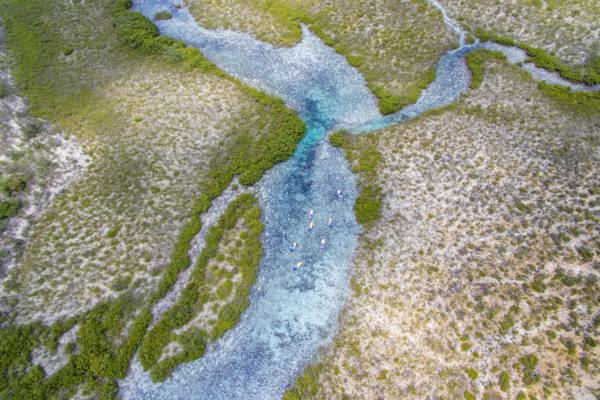 This scenic mangrove island is the easiest to access wetland paddling spot on Providenciales. An excellent place for kayaking or stand up paddleboarding. Channels and paddle boards at Mangrove Cay. 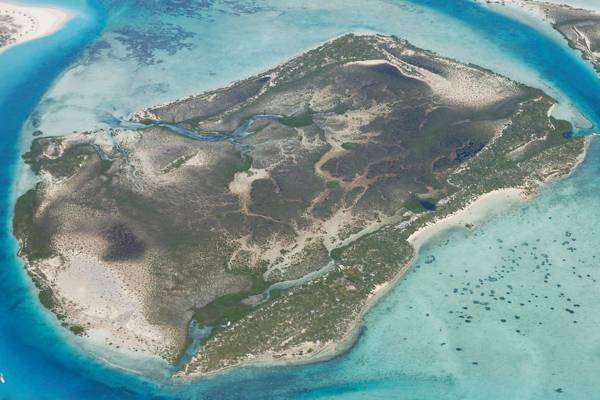 Mangrove Cay is a small 286 acres (116 hectares) uninhabited island located close of the north-eastern end of Providenciales. 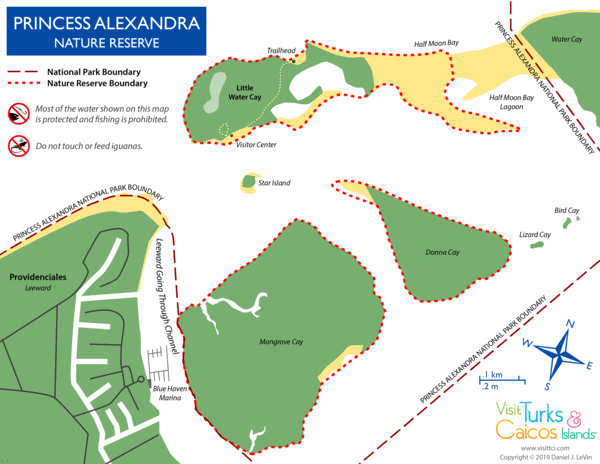 Mangrove Cay, along with Donna Cay and Little Water Cay, make up the Princess Alexandra Nature Reserve inside the Princess Alexandra National Park. As the island’s name may suggest, almost the entirety of the centre of Mangrove Cay consists of red mangroves (Rhizophora mangle). Small and narrow dunes environments line much of the cay’s coast. As a nature reserve, it’s prohibited to fish, collect conch or lobster, or take any natural or historical object from Mangrove Cay. Likewise, it’s illegal to disturb wildlife. An aerial view of Mangrove Cay. 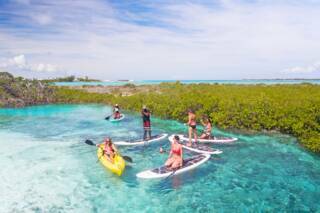 Mangrove Cay, largely due to its close proximity to Providenciales, is one of the most popular kayaking and stand up paddle boarding locations in the Turks and Caicos. Shallow and scenic tidal channels enter the cay in several places, and wind their way for thousands of feet. There’s even a shipwreck hidden down one of the channels! Many shallow channels wind their way through the cay, and these waterways are the most popular spots for eco kayaking and paddle boarding in the country. The Mangrove Cay area is an excellent location for all experience levels of paddlers. 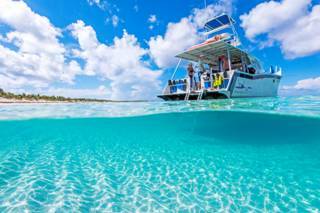 There are sights within easy access of Providenciales, as well as worthwhile longer routes out to Half Moon Bay, Little Water Cay, and Donna Cay as well. The luxury Blue Haven Marina, often hosting impressive yachts from around the world, is located in Leeward Going Through channel nearby, and offers additional interesting sights. Premier eco tour company Big Blue Collective is located directly adjacent to Mangrove Cay, and offers guided tours, as well as rentals of single and tandem kayaks and paddle boards. Mangrove Cay is a haven for marine and bird wildlife. In the channels and shallows surrounding the cay, it’s common to sight juvenile lemon sharks and nurse sharks, small turtles, conch, southern brown stingrays, starfish, and many types of juvenile fish. The sheltering and complex root systems of the larger mangrove trees often hide schools of tiny fish. Birdwatching is also great, and sightings include brown pelicans, green herons, tri-coloured herons, reddish egrets, and American oystercatchers. One of the better-known endemic animals in the Turks and Caicos is our unique Turks and Caicos Islands Rock Iguana (Cyclura carinata), a large and docile lizard. A small amount of sandy ground can be found on the north and southeast edges of Mangrove Cay, and these dunes support small populations of the indigenous iguanas. Turks and Caicos Rock iguanas can be found on several of the uninhabited cays in the Turks and Caicos, and a visit to Mangrove Cay or Donna Cay offers an all-too-rare chance to see a critically endangered animal in its natural habitat. Last reviewed by an editor on 17 April 2019.